Recombinant Bovine CXCL9 (PBP023) detected using Rabbit anti Bovine CXCL9 (AHP2369) as a capture reagent and Rabbit anti Bovine CXCL9:Biotin (AHP2369B) as a detection reagent followed by Streptavidin:HRP. Rabbit anti Bovine CXCL9 polyclonal antibody recognizes bovine CXCL9, otherwise known as MIG (monokine induced by Interferon-gamma). CXCL9 is a member of the C-X-C family of chemokine receptors, secreted by interferonγ stimulated monocytes, macrophages (Muller et al. 2010) and endothelial cells (Loos et al. 2006). CXCL9 acts as a Th1 (type 1 helper T) cell chemoattractant, and plays a role in the growth, activation and movement of cells associated with, and in, tumour growth inhibition and angiogenesis (Whiting et al. 2004). Antisera to bovine CXCL9 were raised by repeated immunisation of rabbits with highly purified antigen. Purified IgG was prepared from whole serum by affinity chromatography. This product may be used as a detection reagent in a sandwich ELISA together with AHP2369 as the capture reagent. Recombinant bovine CXCL9 (PBP023) may be used as a standard. This product may be used as a capture antibody in a sandwich ELISA together with AHP2369B as the detection reagent. 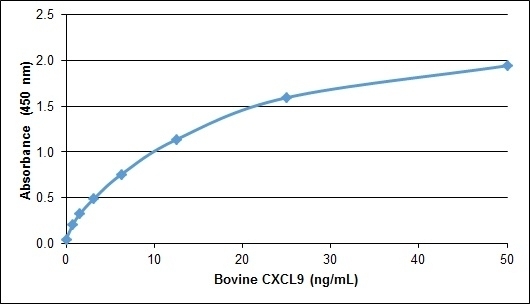 Recombinant Bovine CXCL9 (PBP023) may be used as a standard. Müller, M. et al. (2010) Review: The chemokine receptor CXCR3 and its ligands CXCL9, CXCL10 and CXCL11 in neuroimmunity--a tale of conflict and conundrum. Neuropathol Appl Neurobiol. 36: 368-87. Whiting, D. et al. (2004) Chemokine monokine induced by IFN-gamma/CXC chemokine ligand 9 stimulates T lymphocyte proliferation and effector cytokine production. Loos, T. et al. (2006) TLR ligands and cytokines induce CXCR3 ligands in endothelial cells: enhanced CXCL9 in autoimmune arthritis.